One thing I hadn’t really anticipated about Jerusalem was just how ‘compact’ it is. I just hadn’t really thought about how close together many of the known sites actually are. Maybe it’s the result of living in a medium-sized town or having lived in a city for a number of years, but I’m used to things being a ‘fair distance’ apart. Within the walls of the old town of Jerusalem you’re really never more than 15 to 20 minutes walk from anywhere (crowds permitting). It is, after all, a rough rectangle with its longest side about 1 mile long. Many of the events recorded in the New Testament which took place within Jerusalem happened within a good stone’s throw of each other (ish). 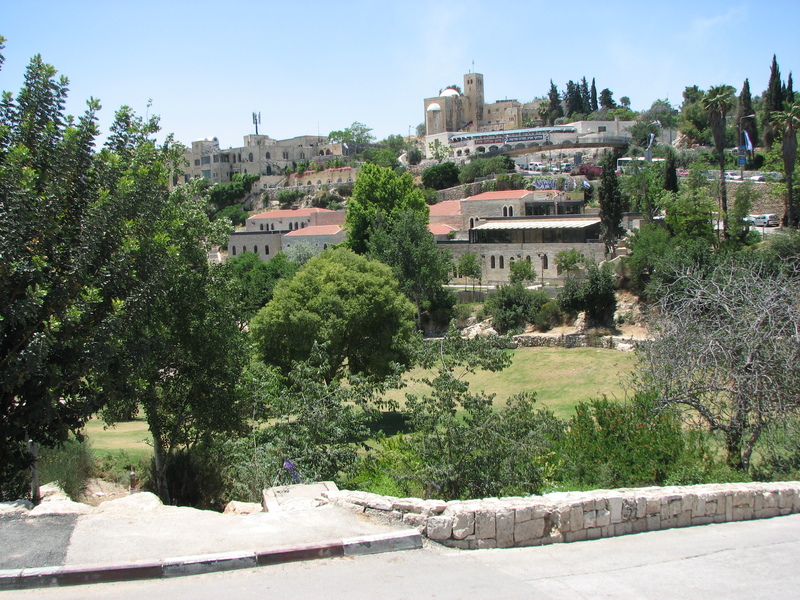 Even moving beyond the city walls, things are never really far away (at least in terms of Biblical sites – modern Jerusalem is a sizeable city, similar in size to Edinburgh); a trek from one place to another only extended because of having to descend into and out of the Kidron Valley or the Valley of Hinom (Gehenna). After our morning visit to the Haram, we spent the afternoon wandering across to the Mount of Olives and viewing many of the sites there and enjoying the views from it. Before we got there though, we stopped off at Bethesda – the place of the healing miracle in John 5. What is fascinating about this place is the excavation of the site. In essence, you can see the ‘layers’ of history. In many respects, when you walk around Jerusalem you’re not entirely walking in Jesus’ footsteps. Many of the buildings and the paths now sit atop the rubble and stone of centuries of building and rebuilding. The site at Bethesda reveals some of those layers, going back, indeed, beyond Jesus’ time. The pool and site is associated with a much older ‘healer’ – Asclepius, the ancient Greek god of medicine. It reminded me of my fascination with the archaeological dig under St. Peter’s Cathedral in Geneva (which I never did get around to blogging about). That site in Geneva had a ‘spiritual’ link going back far into pre-Christian history – it was a burial site for a venerated warrior which, over time played host to various pagan and Christian churches. What fascinated me was the sense that a physical location could become a deeply spiritual place and make that link to the spiritual search within us which pre-dates Christianity and points to our innate spirituality and need to express the ‘beyond’ in some way. Bethesda, in a sense, falls into the same category – a ‘touching place’ with the ‘other’, with God, where the water would ripple from time to time and healing was believed to take place. The miracle Jesus performed didn’t require the water, of course. And how much more powerful would the impact of that miracle have been having been done, in that way, in a place normally associated with healing? Of course, the subsequent events show just what that impact was. But onwards to the Mount of Olives. But this is just one of three significant mosques on this site. Another is the Aqsa Mosque, the main site for Friday prayers. This sits on the southern edge of the Temple area and above another mosque – Solomon’s Stables. The story is that when the Moslems gained control of the site they were so impressed by the Temple remains that they assumed Solomon must have had supernatural help to build. The ‘stables’ – a huge colonnaded (not sure if that’s the correct architectural description) area under the site – must have been where Solomon stabled the Djinns needed to move the massive blocks of stone. The irony being that the huge blocks were a legacy of Herod the Great, not Solomon. The three mosques are not generally open to idle visitors. Nevertheless we were allowed access and were able to photograph what we wanted. In some respects Solomon’s Stables is the least impressive of the three – at least in the sense of ornamentation or fittings. But it is an absolutely enormous space (the photos – the ones of the space with the red and silver-striped carpet – simply don’t do it justice), stunning in its size. The Aqsa mosque is also an enormous space and has some beautiful features. It was fascinating to watch the birds wheel about inside, so large and airy it is. In the photo album, it’s the building with the red, chequered carpeting. Sadly, the Dome on the Rock was undergoing extensive repairs and refurbishment so the area above ‘the Rock’ (believed to be, variously, the site of the Holy of Holies, or where Abraham was to sacrifice Isaac, or where Muhammad left the earth) was shrouded in scaffolding and panelling. There are some photos of the interior though showing some of the beautiful features. But all of this can be looked up in a guide book or online and you’ll find a lot more information and better photos than I can ever provide here. The Haram is a beautiful place, with tree-shaded walks and beautiful architecture. It also houses a project which is restoring ancient manuscripts through very skilled and painstaking work. Groups sit around studying the Quran – and it was noted that there were many more study groups of women to be seen now. But the place is at the heart of the disagreement between Jew and Arab. For each, the site is central to their faith (albeit not of the highest importance in Islam) and, as such, is crucial to their identity. Giving up the site would be like denying who you are. I think it’s this that Western culture doesn’t ‘get’. Listening to groups of US Jews being guided to the Western Wall, it was clear that so much of their personal identity is wrapped up in their national identity which, in turn, is wrapped up in their faith identity. And core to that is the holy site of the Temple. It is from there, that the sense of identity flows. One is left with the impression that without agreement on the Temple area there will never be agreement on any other aspect of the relationship. And it’s difficult to see how the issue of the Temple can ever be resolved. For many Westerners, it’s just ‘a place’. Places have no true importance. Of course we have emotional attachments to places – just think of the hurt and anguish caused by a suggested union of two congregations here. But, ultimately, a place is just a place; a thing of bricks and mortar, of wood and tiles. Certainly for the (Western) Christian faith, a believer’s identity is not in a place, but in the person of Jesus. But I wonder if we also miss a little something in our poor understanding of the Jewish or Muslim faith (and perhaps even the Christian faith). When we place our identity entirely in a person, we can overly personalise our faith. We forget that Jesus was not an individual, but a person of the Trinity, and so inherently part of a community. When our faith is too ‘personal’ we cease to be a part of a community and our ‘identity’ is diminished. Furthermore, that community has a place, both in the sense of its own place in wider society, but also a place where it can gather as a faith community. I think that when we know our ‘place’, within a faith community and within a wider community, then we can more fully serve and live our faith, for we understand its place in our life and in the life of those around us. After an afternoon catching up on some rest, a smaller, ‘intrepid’ group set out to walk down to the City of David and, from there, walk back up to the Old Town, through the Dung Gate, meet the rest of the group and then find a vantage point to view the gathering at the Western Wall as the Sabbath approached. It was a lengthy walk and we took a wrong turn which extended our wander. the City of David is an Arab part of the city and can be an area for trouble. Our word of warning was to answer only in English so as not to be mistaken for Jews, getting caught out with an incorrect reply to a greeting. It was an uncomfortable walk, with an ever-present sense of tension. I’m sure we were probably quite safe, but we were definitely under scrutiny. We were of particular interest to an Israeli Police patrol driving through, getting hard looks from the police officers. I guess we were a potential source of discontent from the locals. It was a definite sense of relief that we arrived back at the main walls and went through. Earlier in the day we had found a good vantage point to view the Western Wall from and we made our way there. It was occupied by a group of American Jews on a trip ‘home’. We did manage to squeeze past to get to the part overlooking the Western Wall,but it was fascinating to listen to the various speakers addressing the large, all-age group of Jewish Americans. One of our group observed that it was in the best tradition of a more evangelical CU or SU group. It’s fascinating to observe, and slowly begin to get to grips with, the whole issue of identity being so bound up in faith and culture. Western culture has largely compartmentalised many of these things. Observing the Sabbath gathering was also an experience. Perhaps a little irreverently I couldn’t help but think of a good-natured football crowd, with the different groups and clothes and chants. Again, there’s that whole issue of identity – faith, and its expression, is not simply something you ‘do’, but who you are. An interesting lesson for Western Christianity which still seems very tied to the ‘do’ model. We arrived in Jerusalem at around 4.30 this morning and, after an all too brief catnap, were up and breakfasted at 8.oo am. I think it’s fair to say the the group looked tired, but all weariness was soon forgotten as we set off for a morning exploring the Old Town of Jerusalem within the city walls. It is, without doubt, a fascinating place, with its narrow lanes crammed with market stalls and shops. There’s all the tourist tat, of course, but you soon find the ‘real’ shops, selling everything and anything. The spice shops announce their near presence with pungent aromas, and do the herbs and fruit sold from stalls or by individuals sitting to the side of a densely packed alley. And for those who are selling goods which do not announce themselves, their voices vie for attention, making the place seem strangely reminiscent of the, now gone, Barras in Glasgow. We spent a fair bit of time in the Church of the Holy Sepulchre, a sprawling building which lays claim to the sites of Jesus’ death and burial, as well as some other places of religious significance. it’s quite a place – at once gaudy, yet magnificent; a place of obvious veneration, and yet also a place which, at times, can spark a riot. Our walk around took in views of the Dome on the Rock, the Aqsa mosque, the Western Wall (wailing wall) and so many other sights of historical significance. We walked through the ancient city gates and stood on paths laid down countless generations ago. It’s difficult to describe the feelings such places engender. There is the sense of history made real, a greater appreciation of where events (probably) took place (and, perhaps surprising, is their proximity – it’s not a huge place) and a growing realisation that our Westernised faith is, in a sense, the tip of an iceberg. Well, maybe not the tip – more probably just one little jaggy outcrop. I also struggle to express my reaction because, in many ways, buildings don’t do much for me. Yes, I like to look at them, appreciate their art and architecture, but it’s ‘just’ a building. Where it becomes more real for me is where it connects to people and many of the buildings we saw today didn’t rally connect me with people. This might sound a little strange, given the history of the people, but I struggled to connect this morning, and not just because of the tiredness of travelling. It might also sound strange from someone who loved the visit to the archaeological dig below St. Peter’s Cathedral in Geneva. But, in that instance, it plotted a history of worship on a site, from pagan hero worship through to the Christian Cathedral today – and, for me, that was a story of people sensing something of God and attempting to express their worship. It was only as we were returning to St. Andrew’s Scottish Guesthouse for lunch that there was an extra spark. Looking across the valley we could clearly see the path of the Separation Wall as it snaked its way across the countryside. In that strange juxtaposition, gazing past the ancient city walls to this new concrete barrier, the sense of a people’s history and story began to come together. Buildings are all very interesting, but when the ancient history clashes with the contemporary we realise that there is an enormously complex story to hand. And that is a story of people, with all its challenges and history and prejudices. Just as a little aside, the photograph is of St. Andrew’s Church and Guesthouse. The valley in the foreground is Hinnom, or Gehenna (otherwise used as a reference for hell). It was suggested that the Church of Scotland is perched precariously above Gehenna. Depending on your views of the recent general Assembly decisions, you can decide whether it is teetering towards or away from the brink. We’re having an afternoon to catch up on our rest, after our long travel time and then heading out to observe the start of the Sabbath at the Western Wall. That’s for another post later I think. The title should, arguably, be T-2 given that we won’t actually be arriving in Israel until very early on Friday morning, but we do set off tomorrow and that’s what counts. So T-1 it is. I was looking up the places we’ll be staying and they have guest wi-fi, so the laptop will be coming with me and I’ll try and post something each day, if I can (and I’m awake). Virtually everyone I have spoken with who has been to Israel, however briefly, have all spoken of the impact it made on them. Whether it was the sense of stepping into history or the challenge of the separation barrier, there was something that left an indelible impression. So, I’m not really sure what to expect. Indeed, I am going with no expectations and simply will wait and see what strikes me each day and even each hour of each day. I’ve also been encouraged to keep an audio diary (for future radio show use) so I’m hoping that the ‘pressure’ to reflect on what I’m seeing and doing will not become the overriding sensation and that they will, more naturally, flow from the experiences. There’s a bit of me that acknowledges that the trip is, in some respects, ‘external’ to my faith. I don’t need to see the places or walk the paths or experience the history in order for my faith to be ‘real’. But it’s an opportunity to add ‘colour’ to that which we read of in black and white. It’s also an opportunity to share some of that experience with others who are on the same journey and I find that more exciting in many ways. And all the more exciting because it is that shared experience, not simply a second-hand description of a place, an event or a conversation. One thing I can be sure of though – I suspect I will have enough material to see me through Guild talks and kids’ addresses for the foreseeable future. Travel – and somewhat tedious it is too. Depart Edinburgh 13.35, arrive Tel Aviv 2.30, Friday morning!!!! Arrive St. Andrew’s hostel, 4.30/5.00am !!!!!! After a whole 3 hours kip, it’s up and out and walking round the Old City, taking in the Church of the Holy Sepulchre. Lunch and siesta (or whatever the Israeli equivalent is). Early and late evening, more Old City walking and the start of the Sabbath at the Wailing Wall. Early start, heading for Hebron, Herodium and Bethlehem, including a visit to the Ecumenical Accompaniment Programme in Palestine and Israel (EAPPI). Sabbath worship in the Church of the Holy Sepulchre. Long lie – breakfast at 8.00. Worship at St. Andrew’s, Jerusalem. Early start, heading to Masada, the Dead Sea, Qumran, Jericho. Tiberias and a swimming pool! Communion at St. Andrew’s, Galilee. Sail on Sea of Galilee with morning worship on the boat. Haram (Dome of the Rock, Aqsa Mosque). St. Anne’s / Pool of Bethesda. Mt. Scopus, Mt of Olives. ‘Flexi-day’. Time to explore on our own or to revisit sites. Outrageously early start to head home.